I'm currently working on writing a function on AWS Lambda. 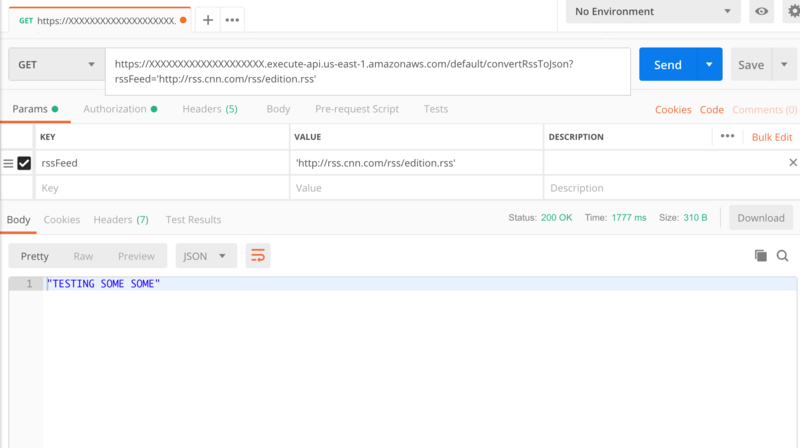 I want to convert a RSS feed into a JSON and give that as a response in the body when making to the Lambda endpoint. However, in the logs I get undefined when console.log(rssAsJsonData). The piece of code above is a callback. Under the hood, feed.load is asynchronous, which makes your callback be executed asynchronously. your rss object inside convertRssIntoJson does not hold any value yet, because the callback hasn't been populated up to now. This is where your undefined comes from. Callbacks themselves don't make code asynchronous by default, but NodeJS works with a non-blocking IO model and, since feed.load is an IO call, it will be executed asynchronously. Since your handler is async, it means it can just await on Promises. If you want to know more about async/await, you can see it in here.